Water is a valuable commodity in the Bakken petroleum system (Bakken) region of western North Dakota for drilling, completion, production, and maintenance-related activities. Water use and management in western North Dakota have changed dramatically over the past decade as a result of the unprecedented growth and development of the Bakken and consequent adaptations by the state and industry to meet the rapidly growing need for increased water supply and disposal options. To that end, the EERC has been closely tracking the challenges associated with Bakken water management and evaluating the technical and economic feasibility of various technological advancements and water-handling practices. 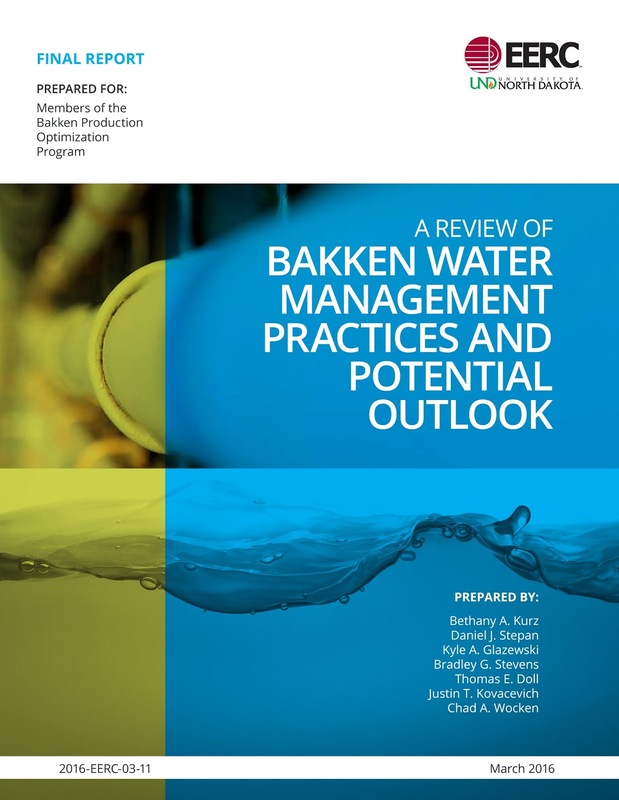 As part of the EERC’s Bakken Production Optimization Program (BPOP), the EERC has released a report providing a synopsis of past and current water management practices in the Bakken. "In the past decade, there have been dramatic changes in water management practices in the western part of the state as a result of oil and gas development in the Bakken petroleum system," said Beth Kurz, Principal Hydrogeologist and Laboratory Analysis Group Lead. 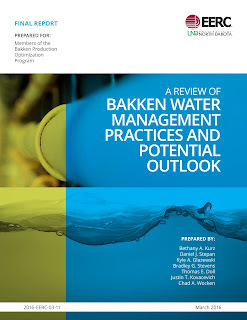 "This report summarizes the history of water use and handling in the Bakken over the past decade and how industry and service companies have rapidly adapted to address some of the challenges associated with water supply, transport, and disposal." Kurz continued, "While freshwater use for oil and gas development accounts for less than 5% of the total for municipal, rural, industrial, and agricultural use within North Dakota, it is important to optimize the use, transport, and disposal of water in the Bakken to minimize issues that could affect or delay surface operations for the oil industry," she said. The report also provides an estimation of future water supply demand and disposal needs, an overview of potential treatment technologies, considerations for recycling and reuse, a summary of the implications of the report findings for our partners, and recommendations for future work. "Several data sets including freshwater withdrawal locations and volumes, produced water generation, and saltwater disposal locations and volumes were provided to the EERC from the North Dakota Industrial Commission and the North Dakota State Water Commission, which proved to be invaluable in the assessment of past and future water management practices," Kurz said. "The EERC would like to offer its sincere appreciation and gratitude for their contributions." According to the report, current data and water use projections suggest that, absent a prolonged drought, there appears to be sufficient freshwater supply for continued operations in the Bakken; however, the large volumes of produced water generated now and in the future may warrant a proactive approach by industry to increase produced water recycling and reuse. The primary demand for freshwater in the Bakken is for hydraulic fracturing and well maintenance. Current estimated freshwater demand is approximately 267 million barrels a year and may increase threefold by 2035. "The unprecedented oil and natural gas production in North Dakota has also resulted in a substantial increase in the volume of produced water being generated," Kurz said. "The primary mechanism of disposal in North Dakota is saltwater injection, most of which occurs in the Dakota sandstone; therefore, it is important that we understand the long-term capacity of the Dakota to serve as a saltwater injection horizon." While improvements in fracturing fluid formulations enable the use of high-salinity water as a source of makeup water, it is estimated that less than 5% of the wells drilled in 2014 utilized produced water for fracturing fluid makeup. This is, in part, due to a lack of incentives to recycle and reuse produced water and the care that must be taken when large volumes of brine are stored. Before widespread brine recycling and reuse can occur, industry and regulators will need to define the regulatory process and acceptable containment practices required for large-scale saltwater storage in the Bakken. Click here to download the full EERC BPOP report.